Despite government assertions that its new rules governing the oil and gas industry in New Brunswick are among the most strict in North America, some environmentalist's say that won't stop people from opposing the shale gas industry. Despite government assertions that its new rules governing the oil and gas industry in New Brunswick are among the most strict in North America, some environmentalists say that won't stop people from opposing the shale gas industry. Stephanie Merrill is the director of the freshwater program at the Conservation Council of New Brunswick. "If anything I think it does the opposite because to the opposition, to people in the communities, it's a feeling of disrespect and that they're not being taken seriously, being listened to and so if anything I think that this will be an interesting spring when companies start up their operations that they've been given the green light to do," she said. While Merrill admits the rules help to alleviate some concerns, she said part of the problem is that the rules lack the teeth to enforce them. "I don't think that the government has the political will to really step up and do what they've put into this set of rules, we already know that the government has deregulated 50 per cent of wetlands in the province, they're not moving forward at enforcing the water classification program that they've established over the last 10 years so those are already existing pieces of legislations and policies to protect water in New Brunswick that have been stalled or abandoned," she said. "So I don't think that New Brunswickers feel safe, and I certainly don't, knowing that we're looking at a whole new set of rules for a brand new industry when we don't have a handle on our existing rules and regulations and our will to actually enforce those." However Energy Minister Craig Leonard said he is confident the new rules will protect landowners against any potential conflict with the oil and gas industry. "It's about taking care of the landowner first and then making sure we can go after industry after that. We don't want to get people getting into that situation where they're having to take on the large companies on their own." Leonard said when it comes to damages, the province will step in to remediate, and then deal with the company. For example, the province will require financial security deposits from the companies of $20,000 per well, to a maximum of $500,000 per operator. 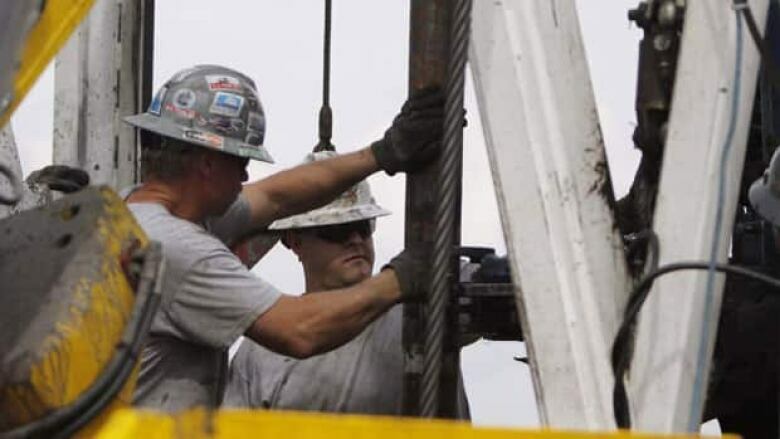 Leonard also said shale gas companies must have liability insurance in place of $10 million to pay for anything which results in personal injury or damage to property or the environment. Merrill argues that it will be difficult for the government to act objectively should a dispute arise. "I don't think that the government can play an objective role in being a public intervener when there are disputes in a community over water issues or property rights issues," she said. "The government is playing this dual role where they are trying to expand the industry and obviously collect as much royalties as they possibly can, while at the same time playing judge and jury for communities and I don't think that they can play that role effectively." Both sides have problems ... a good sign? Industry representatives are describing the new rules as "onerous overall," and argue the province should follow the model out west. Grant Wach, professor in the Department of Earth Science at Dalhousie University, headed a symposium at the university a few weeks ago on oil and gas production. He said both sides seem to have problems with the rules, and that's a good sign they're on the right track. "I think this is a really good first step and I think that with response back from industry and the public, as one of or panel members said, 'The best regulations are those that make everyone slightly grumbly — it shows that one party is not being favoured over another,' and I think that's the point we're at now so that looks pretty good," he said. Wach said malleable rules make fine-tuning regulations easier and more effective. "I think these are very positive first steps pursuing proper guidelines and a framework for the industry and it is an initial two-year trial period which gives time for the province to fine-tune their components of these regulations," he said. Wach said each well is different but he said the potential for damage to water supplies is slim except in extraordinary circumstances. "I think in terms of safeguarding water supplies, for example, there's no fracking allowed above 600 metres and if you had a water well down to 600 metres depth, that would be pretty extraordinary," he said.